There’s something deeply satisfying about seeing skilled people describing their craft, frankly it’s our addiction to that feeling which has powered Directors Notes from the very beginning. It’s also what makes Goodwin & Goodwin profile doc Signs with Soul from filmmaking duo Reuben + Jamie (Reuben Armstrong & Jamie Neale) such a compelling watch – that and the inventive use of multiple techniques the pair deploy in the film. In our interview, I attempt to pry a few tricks of the trade from Reuben + Jamie that they used for this playful portrait of what happens when craft and passion come together. 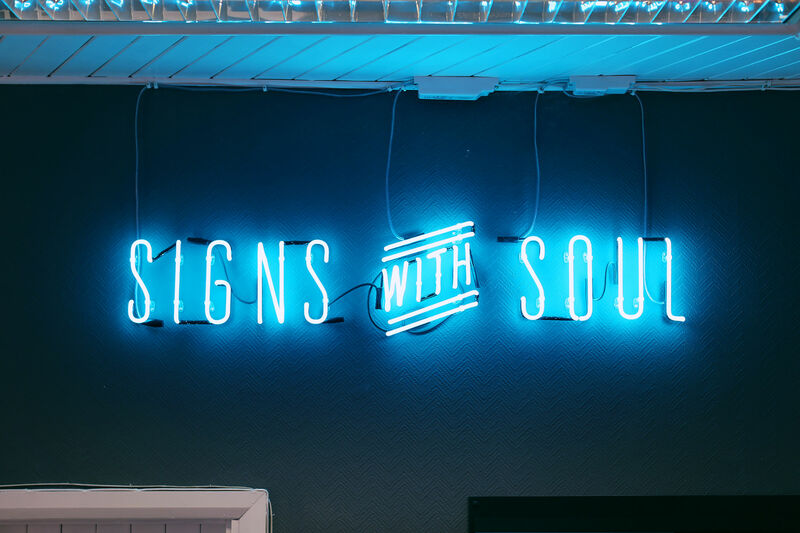 What inspired the playful approach Signs with Soul takes towards Goodwin & Goodwin’s work? For Goodwin & Goodwin we wanted to capture the quirky personality of the business, the inherent creativity in the team and the fun, ‘not-too-serious’ atmosphere. Sign-making is a hands-on craft with a clear design aesthetic so we felt the film should take on a similar tone. We came up with the idea of ‘moments of wonder’, which would bring the workshop to life through a range of moving image tricks and experiments, ranging from stop-motion to jump cuts, green-screen to time-lapse. The idea was that we would create a range of visual effects that would make the employees look like magicians, whilst also hiding some of the real ‘tricks of the trade’ that Goodwin & Goodwin didn’t want to give away! How did you practically realised that concept during production? The shoot took place in two phases. First we interviewed everyone in the company, over the course of one day. Then we took the hours and hours of rushes and spent hours and hours watching them back and picking our favourite moments – we wanted to find the moments where people were just being themselves and saying things naturally. Sign-making is a hands-on craft with a clear design aesthetic so we felt the film should take on a similar tone. Then we created a rough audio edit of the overall narrative of the documentary and set about creating shots to cutaway to. We spent two weeks working alongside the Goodwins in the workshop, experimenting and creating animations. By this point we were clear we wanted to make lots of little gags, as we wanted them to work as mini-moments shareable on Instagram and GIPHY. Did any of the sequences you created require custom made signs from Goodwin & Goodwin? We tried to create as many of the sequences as possible from existing signs, or parts of signs, that the Goodwins had in the workshop, to minimise waste as much as anything. But all their sign-makers were super helpful and we were able to do a few custom bits and bobs along the way. As we had the audio narrative pretty much nailed down we searched the workshop for things to animate, and with all the letters and numbers they had, we were able to animate some stuff to sync ‘picture-to-sound’ which added another dynamic to the edit. Could you break down some of mechanics at work behind the scenes? What software/equipment did you use? This is a complicated contraption involving a large amount of helium balloons… Ha no, this is actually just filmed in camera. The boxes are empty. It involved us lifting the palette & boxes with two bars and then we roto-scoped the bars out after. You can sort of still see the bars in the shadow. Again, simple techniques worked best. This is just a jump cut and some good timing from signmaker Val. We marked the table to show where to bang the metal. Then Reuben is hiding under the table ready to turn the light on when Val clicks his fingers! This is our most popular GIF for some reason – people love coffee! It’s already on 7 million views. We won’t fully tell you our secret on this one, but we can confirm we didn’t cut a hole in the table! The sound design and score are top notch too. Yeah, big shout out to Jamie Frye, our sound designer. He created a makeshift foley booth in the spraypaint room within the workshop and recorded a load of sounds from all the weird and wonderful tools we could find. He also used an amazing transistor microphone that picks up electrical frequencies and those recordings are out of this world! Jamie also composed all the music (including playing the drums on paint pots and buckets!) and we ended up with a nomination at the Short Sounds Film Festival – the guy’s a genius can’t thank him enough for his help on this one. What will we see from you guys next? With regards to upcoming projects, we’re working on a few documentary ideas, looking at slightly longer-form content. But we’re particularly keen to do more GIFs too – working them into future projects wherever possible. We’ve found the restrictive nature of GIFs really push your work and any way of using little bitesize snippets really helps extend your reach online.